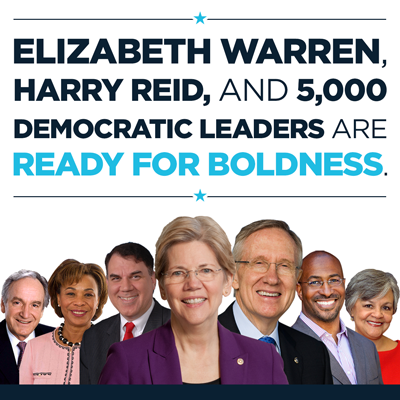 Join 5,000 political leaders calling for "big, bold, economic populist ideas" in 2016. We want the 2016 Democratic presidential nominee to campaign on big, bold, economic-populist ideas that tangibly improve the lives of millions of Americans. We urge all candidates for president to campaign on big, bold ideas – such as establishing a national goal of debt-free college at all public colleges and universities, expanding Social Security benefits instead of cutting them, creating millions of clean-energy jobs, reducing big-money influence in politics, breaking up the “too big to fail” Wall Street banks that crashed our economy, and ensuring that working families share in the economic growth they help create. Bold economic populist ideas are popular with Democratic, Independent, and even Republican voters -- and are key to victory in 2016. We have a responsibility to choose the best candidate for our state, our party, and our nation. We take our responsibility seriously. Below is a list of 5,000 elected officials, Democratic Party officers, union leaders, and grassroots activists who have signed this statement, including Senate Democratic Leader Harry Reid, nearly 200 state legislators and 25 members of Congress. Sign this statement. Write a letter to the editor. Call voters about candidates' positions. Host an organizing house party. Attend events in my area. Lead events in my area. Ask candidates questions in town meetings. Ask local officials to join the cause. Check any of these that apply to you: I am a current or former elected gov't official. I currently hold this office. I am a current or former political party official. I am a union leader. I lead a grassroots organization. I am a candidate for political office. I am interested in running for Congress. Would you chip in $3 to help get volunteers organized in Iowa and New Hampshire? Yes, I'll donate $3. Yes, but I'll donate more.